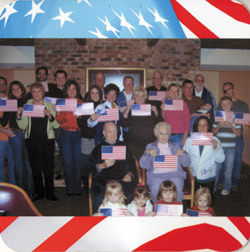 We’re very proud to offer a photographic aluminum panel that you can send to a family member or friend in the armed services. We’ll mount your supplied photo to a durable aluminum panel that is heat, sand and water resistant. Pre-drilled holes in the panel allow for easy mounting. We are supplying 1,000 of these panels at no charge although donations are welcome so we can continue this program. Please send us your image (digital or print) and include your return address. We will process the panel and send you a Vertical VisionsTM for Heroes aluminum (lightweight) panel that is heat-, sand-, and water-resistant with desired picture laminated to it. Send it to your fighting GI in your next overseas package! We can also accept regimental colors for one side of the panel. Send a gift to your deployed G.I., a durable metal 8″ x 8″ panel with holes in the top and sides to be strapped to boot lockers or bunks. On one side of the panel is a picture of you or your family and the other side is an image of the Statue of Liberty or regimental colors.